There’s nothing like a cup (or tall glass) of mint tea to freshen you up every day. Mint teas are crafted using a wide variety of tea bases (black, white, and most commonly, green), and accented with a range of herbs and spices (ginger, lemongrass, and orange peel, all the way to cucumber, lavender and chocolate). What they all have in common are the refreshing, sweet, uplifting notes of peppermint, or spearmint, or both. Wait, how does peppermint differ from spearmint? Both peppermint and spearmint are used to prepare mint teas. But there are some key differences in their aroma and flavor. Spearmint, with a long history of use in medicinal green teas, is mild, sweet and calming in nature. This makes it a key ingredient in a number of teas designed for sleep and relaxation. Peppermint contains menthol, which is responsible for its ‘livelier’ scent and taste, as well as its cooling effect. Though there are no fixed rules that govern mint tea recipes, peppermint is usually found in black tea blends with spicy add-ons such as ginger. Spearmint pairs well with green teas and oolongs. Moroccan mint tea blends traditionally feature spearmint and Chinese Gunpowder green tea. Whether to consume it sweetened is up to you, but the original recipe assumes a healthy dose of sugar and is nothing short of legendary. Tea drinkers generally prefer mint teas for their “subtle”, “palate cleansing” nature, and their ability to “soothe and refresh at the same time”. Classic Moroccan mint teas are spearmint based, though a number of modern variants include peppermint as well. They tend to be “sweet” and “easy to drink”, “quite vegetal”, “mildly minty”, with the tendency to “get bitter when oversteeped”. A strong spearmint tea works as a “good afternoon pick-me-up”; the taste of spearmint “tends to linger” for extended periods of time. Peppermint teas are often prepared with white tea bases and spicy accents for a “festive, wintery” feel. They taste “great with a little milk and sugar”, though neither is necessary. Mint teas give you a lot of room to experiment with flavor pairings. Citrusy accents such as lemon or orange peel add a nice depth to your cup of mint tea. Most varieties of mint tea double up as refreshing iced drinks as well, especially with a slice of lemon added in. This super easy to make cold brew iced tea is healthy and inexpensive. It’s a great alternative to store bought sugary drinks. Cold brew method delivers perfectly smooth flavor with no bitterness whatsoever. In a glass container, combine loose leaf tea and room temperature water and refrigerate overnight. Next day, filter tea leaves with a strainer. 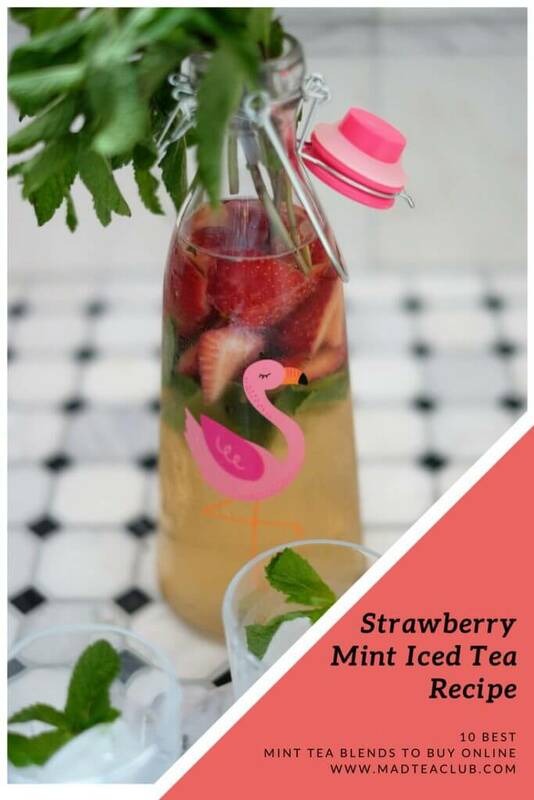 In a wide mouth glass water bottle or a pitcher, combine strawberries and mint leaves, add green tea brew and honey to taste. Leave to infuse for another 2-4 hours in room temperature. Serve over ice with a slice of lemon or cucumber. Enjoy!